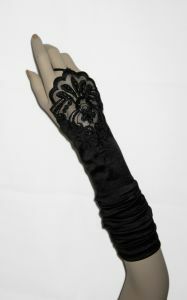 Gloves can add just the right finishing touch to your bridal ensemble, special occasions, pageant and proms. They look fabulous with any gown. The gloves have just a touch of spandex to give them a perfect and comfortable fit to any size hand. These bridal gloves are brand new and sealed in packaging. These are beautiful satin lace, beaded fingerless gloves. The beading and lace detailing on these gloves is absolutely gorgeous. You can wear them during the ceremony and your groom can easily slip on your wedding ring. The gloves are gathered on both seams for a romantic look. The gloves measure 19" long from figertip to glove opening. This glove ends just below the elbow. You can also stretch the gathers on the gloves tighter and the gloves can come up just over the elbow. When laying flat, the gloves measure 12" long. These gloves have a smooth and silky finish which gives it an elegant look and is a lovely complement to any bridal dress fabric.